STUNNING BEACHFRONT LOCATION. Pride of ownership shows in this clean and comfortable 3 bedroom, 3 bath home. A perfect gathering place for family and friends. Everything you need is provided for the vacation of a lifetime. Outdoors we have a picnic table, chairs, outdoor BBQ station, outside shower, and more! Step right onto the sandy beach from the front yard. Watch the whales go by in season. Share the gorgeous sunsets with loved ones. Stroll the sands and reflect on how wonderful life can be! Our beach is perfect for relaxing, swimming, surfing, snorkeling, and romantic walks. We want your visit to be memorable, relaxing, and enjoyable. 35 minutes from Honolulu airport, 45 minutes from Waikiki(but a world of difference!). 15 minutes to Waimea Bay and 30 minutes to Polynesian Cultural Center. Located in Haleiwa Town, close to shops and restaurants. Stunning sandy beachfront--unbelievable location! Best spot on the bay. Everything you need here,coffee maker, toaster oven, microwave,dishwasher, rice cooker,pots and pans and utensils. Balcony off of upstairs master suite--stunning views from there, watch the whales go by, surfers, swimmers, and kayaks. Beautiful and comfortable! Easy to get to and has all the amenities. We had a group of 7 and the home was plenty of room. The outdoor bathroom is great-the only outdoor part is you enter the bathroom from the outside. It is very handy when you are on the beach. Kitchen has all we needed to fix meals from pancakes to a shrimp/steak dinner. We had a great time and the home was very relaxing! Very close to Hale'iwa Town with all the shops. We will definitely stay here again! Location was great. House is funky yet functional, has all the kitchen, linen and beach items you’ll need. Can’t say much for the noisy neighbors partying at 4:30am but mid-week was quiet and beautiful. Loved the town of Haleiwa and the whole North Coast but really we just enjoyed watching the waves roll in, swimming, reading and relaxing at this location. We’d return. Very Clean, well stocked kitchen, amazing location! Be aware one of the 3 bathrooms is a shower sink and toilet you enter from the back of the house. It’s amazing when your outside but has no mirror or counter space to get ready. My family and I had a wonderful stay in Haleiwa. The house was exactly as described. The beach view was lovely, the rooms were clean and we had access to everything we needed, including games for the kids, beach towels, sunscreen, menus from local restaurants, etc. We couldn't have been more pleased with the location or amenities. Mahalo for vacation memories we will always treasure. The property is beautiful! Location, location, location!! We have been staying here since 2011, and look forward to planning our next stay! Thank you for sharing your home with us, and thanks to management for all your efforts if ever we need anything. We are on the beautiful North Shore of Oahu. There are miles of white sand beaches. In Haleiwa, there are shops and restaurants for you to enjoy. Fresh fish is sometimes sold at the nearby harbor, and there are farmer's markets with wonderful fresh local produce. 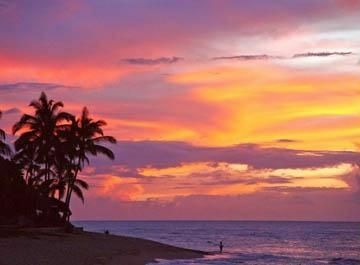 Drive into Honolulu for even more shopping and night life, or stay on the North Shore and experience our laid back life style.